The Hampton Inn Atlanta-Cumberland Mall/NW in Georgia is conveniently located at the junction of I-285 and I-75 next to the Cumberland Mall and Galleria Convention Centre. This Hampton Inn Atlanta hotel located in the Cobb Galleria Area and off the beaten path feels like home when you have one of our chocolate chip cookies at the desk. The Hampton Inn Atlanta-Cumberland Mall/NW is just minutes away from downtown Atlanta 7 miles north of Six Flags Over Georgia amusement park 10 miles south of White Water amusement park and 12 miles southeast of the Atlanta Zoo. Our Hampton Inn Atlanta-Cumberland Mall/NW hotel is surrounded by many fine shops and restaurants. Enjoy Georgia hospitality within 1 mile of the hotel and dine at Carraba*s Italian Grill Longhorn Steak Malone*s or Canoes Restaurant in downtown Vinings. The Hampton Inn Atlanta-Cumberland Mall/NW hotel in Georgia offers all the great Hampton Inn hotel amenities such as a complimentary deluxe hot breakfast high-speed internet access complimentary USA Today in-room coffeemakers iron - ironing boards hairdryers and local calls. The Hampton Inn Atlanta hotel in Georgia has a full service business center that allows you to keep in touch with office family and friends featuring a computer with high-speed internet access printer fax and copier. The Hampton Inn Atlanta-Cumberland Mall/NW hotel in Georgia invites you to relax beside our outdoor pool after a refreshing workout in our exercise room. 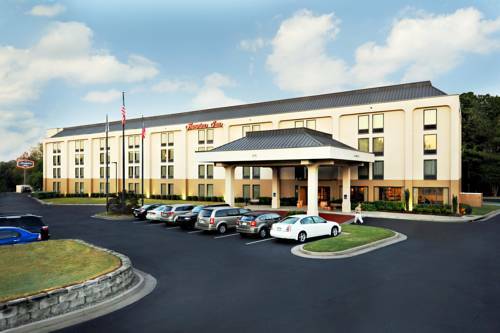 The Hampton Inn Atlanta hotel also features a Board Room for up to 10 people and a Hospitality Suite for 25 people. The hotel also offers connecting rooms shuttle service microwaves and refrigerators laundry/valet services and meeting/banquet facilities. We love having you here at the Hampton Inn Atlanta-Cumberland Mall/NW in Georgia.